Political contests in Southeast Asia as in the rest of the words have often been influenced by identity claims and featured arguments around ethnicity, race or religion. In recent years, however, identity politics have played a more significant role in maintaining political power and even more in the race for political offices. Elections, when held, have exposed identity cleavages within plural societies and a tendency to articulate discourses around “indigenousness”, “moral purity” or “homogeneity” at the cost of a constructed “other”. Reflecting on these issues and their implications for this region and its people, early this year Rosalia Sciortino, Director of SEA Junction wrote an article with the title of “Scapegoating the Other in Southeast Asia” for The Jakarta Post (see link below). The article aimed to show that even if the victims differ, the dynamics and objectives of their persecution are similar. To unify support and gain popularity, win elections, or simply stay in power, political groups construct the perception of a uniform majority with shared characteristics along ethnic, religious, socio-cultural or gender boundaries that is threatened by a common enemy to be despised on moral and religious grounds. The targets are preferably people who are already stigmatized; whom the public would not feel compelled to defend due to entrenched and diffuse prejudices. Taking the lead from the article, SEA Junction, TIFA Foundation and Panna Institute are proposing a photo exhibition with the same telling title to be held on 6-9 December 2018 at Komunitas Salihara arts center. 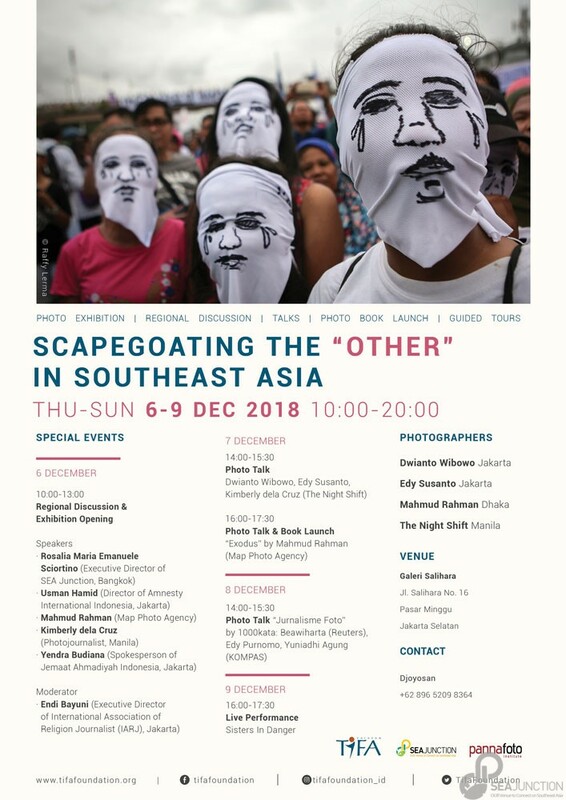 By bringing together three separate bodies of work concerning the Philippines, Myanmar and Indonesia, the exhibition documents some of the most egregious examples of this “us against them” tactic currently occurring in the region and exposes the enormous human toll and suffering they are causing. For the Philippines, the Night Shift photographers meticulously document the human impact of President Duterte’s War on Drugs to “protect the nation” from the “greatest domestic threat”. The grimly photos put a human face to the estimated 30,000 extra-judiciary killings of suspected addicts and show the despair of their families. This State crime, ironically taking place in the only ASEAN country with no death penalty, is made socially palatable by the demonization of the victims because of their supposed addiction irrespective of the fact that they are actually mostly young, poor and barely, if at all, involved in drug use or trade. Besides, this extreme punitive approach is out of step with international trends favoring drug policy reforms like decriminalization and treating addiction as a public health issue. Scapegoating is also at play in Myanmar, but its contours are ethno-religious. Mahmud Rahman of Map Agency records the plight of the Muslim Rohingya in refugee camps in Bangladesh after their most recent flight from the predominantly Buddhist and Burmese country of Myanmar. As the chair of the UN fact-finding mission, Marzuki Darusman, concluded “It is an ongoing genocide that is taking place at the moment,” and Rohingya continue to suffer from their forced statelessness, uncertain conditions in the camps, and restrictions and repression at “home”. Selected photos from two previous exhibitions (“Unmentionable” organized by SEA Junction and TIFA Foundation last February at the Bangkok Arts and Culture Center and “Exodus” held last May by Action Aid in Dacca) now exposed in Jakarta raise questions on the human costs of upholding sectarian “citizenship” and “nationality” criteria rather than embracing diversity, and the fate of refugees in a world showing diminishing compassion for those seeking refuge. The same concerns about identity politics and politicization of religion are also rife in Muslim-majority Indonesia, where local and national elections are increasingly marred by discrimination towards all kinds of “others” from LGBT to political and religious minorities. An exemplification of this worrisome phenomenon is provided by the photos of Dwianto Wibowo and Edy Susanto about the displaced Ahmadi community in East Lombok. They have suffered property destruction, eviction and displacement from their homes in disregard of their most basic rights. What is at stake is not only the constitutional freedom of worship and the very core principle of the national ideology “Bhinneka Tunggal Ika” (Unity in Diversity). By exposing these dramatic experiences, we argue that unless we reject identity politics and refuse to condone abuses against more vulnerable groups, we will be responsible for wide-spread suffering to our fellow human beings. May these photos and related talks and presentations serve as a reminder of the intrinsic rights of minorities grounded in our shared humanity with the “other”. A grant making institutions working for human rights and democracy in Indonesia and supporting civil society to work in key fields like access to information, community and independent media, legal aid, anti-corruption, and minority rights. In recognition of the importance of placing Indonesia within the broader regional context, since 2016 Tifa Foundation has started the Regional Hub program cooperating with the New Mandala and now with SEA Junction. For more information see http://www.tifafoundation.org (in Indonesian).